TrackR pixel and TrackR wallet 2.0 make up the new TrackR product portfolio, making personal item management faster and more affordable than ever. SANTA BARBARA, Calif., Jan. 2, 2017 /PRNewswire/ -- Today, TrackR, a leader in personal item management innovations, unveiled two new products ahead of CES 2017 in Las Vegas, Nevada. The new portfolio includes a smaller and lighter form factor and a wallet-thin credit card sized form factor. TrackR pixel, which comes in nine fashionable colors and starts at a lower price point, allowing consumers to track all of their items at home and on the go. TrackR pixel can quickly locate items in a similar way to TrackR bravo, but is smaller, lighter, and has an LED light that turns on when it is activated to make finding items in the dark even easier. At just 26mm in diameter and 5mm thick (about two quarters stacked), it is one of the smallest item trackers on the market. TrackR wallet 2.0, one of the thinnest trackers on the market at just 2mm, or about the thickness of two credit cards. Shaped just like a credit card, TrackR wallet 2.0 uses new carbon fiber technology to achieve this remarkable thinness while maintaining all of the functionality of TrackR bravo, including replaceable CR2016 batteries. 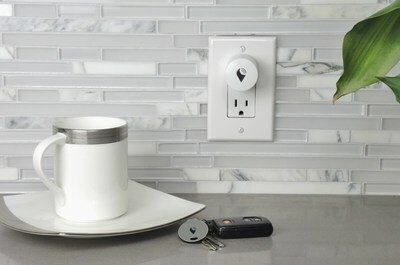 Both of these products work with TrackR atlas, a Bluetooth, Wi-Fi wall plug that makes keeping track of tagged items in the home a breeze. TrackR atlas runs on the TrackR cloud-based platform to create a floorplan of your home and detect any tagged item within. Consumers build the floor plan on the app and can see the specific rooms the tagged items are in, set alerts for when an item enters or leaves a given room, and get a history of where items have been. TrackR atlas will integrate with Amazon Alexa-enabled devices so consumers will be able to ask Alexa where an item is and have her direct them to the correct room in their house. Plus, TrackR atlas will work with other Bluetooth devices, including other trackers. "Our goal at TrackR is to offload the task of remembering where items are to computers, so people can take care of more important things," said Chris Herbert, CEO and Co-Founder of TrackR. "The more things people can track, the more people who have the app, the less expensive and more integrated we can have TrackR devices – all of these contribute to making it easier and faster for people to find the stuff they need. We'll do that for you so you can clear that headspace and time for higher-level tasks." TrackR will be showing all three products at CES 2017 this week. The team will be at CES Unveiled on Tuesday, January 3rd; on the CES show floor and ShowStoppers on Thursday, January 5th; and CEO and Co-Founder, Chris Herbert, will be speaking on a panel at the [email protected]/Family Tech Summit on Friday, January 6th. TrackR pixel is available for pre-order now for $24.99 and will begin shipping in Spring 2017. TrackR wallet 2.0 is available for pre-order now for $29.99 and will be available in late Spring 2017. TrackR atlas is available for pre-order now for $39.99 and will begin shipping in Spring 2017. TrackR was founded in 2009 to make lost items a thing of the past. The company's app software, cloud databases and wireless devices revolutionize how consumers keep track of their items and is creating a world where valuables are no longer lost. TrackR has shipped more than 4.5 million devices, has been ranked #1 as the fastest growing company by Pacific Coast Business Times and #155 by Inc. 500. TrackR is backed by The Foundry Group, Resolute Ventures, IncWell Capital, Amazon Alexa Fund and Orange Fab. With TrackR, your search is over. TrackR is available at www.TheTrackR.com and retail outlets worldwide.